As you may have heard, The AEG Fly Fishing Film Tour is now evolving into The Fly Fishing Film Tour sponsored by The Drake. Tom Bie, Chris Keig and Doug Powell acquired the tour from previous owners Terry Wolvert and Jim Crystal shortly after Thad Robison, Justin Crump, Chris Owens, and Brian Jill emailed resignation messages to all the sponsors on 12/31/08. The DF3 Tour is scheduled to be in a town near you starting next month. The most substantial change that the new owners highlight is that the filmmakers will take a share of the profits, based on a model that the Banff Mountain Film Festival has been using for years. For a more detailed account of this story, read Tom Bie’s post from 1/16/09 titled "The show must go on". I plan to attend the Ventura, CA tour date (Patagonia is still the official clothing sponsor) in mid-February which has marked the tour kick off but that date is still TBD. I’ll keep you posted as more develops. It's official, the Drake Fly Fishing Film Tour World Premier will be in Oxnard on Wednesday February 18th. The event location is at Oxnard College, Performing Arts Center, 800 Hobson Way, Oxnard,CA. I'll update you on ticket sales, special guests and films when I know more. We (FeltSoulMedia) are going to have the Eastern Rises trailer and possibly the Egdorf Camp section from Red Gold on the tour. The videos will be projected in Blue Ray and Thad will be MC'ing. Tom is leading a pretty progressive profit sharing program with film makers which is great. All is looking good. Sounds like things are moving along quite well. Any word on other dates in Febuary? I am taking a vacation and was using this as an excuse to travel to Boise to see a buddy and catch the show which has since been rescheduled in March. Any Pacific NW dates in Febuary that you know about? They’re still finalizing a few things Ryan, but the new and revised website is supposed to go live on Thursday or Friday. When it does it will show all the dates, times, etc., and will allow people to purchase tickets. I'll keep you posted. Travis, thanks for the beta. 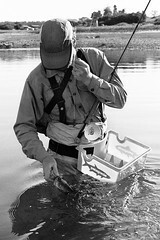 www.flyfishingfilmtour.com has just been launched, showing the new films and venues across the country. Check out what is coming your way. The FFFT got off to a good start on Thursday night with the event benefiting Project Healing Waters down in Colorado Springs. Good attendance - probably 250 folks - and a classic new-school blue grass band called Grass It Up. They did some hilarious covers of Prince and KC & the Sunshine Band - a good time had by all. The film selections were quite good and everyone left stoked to get on the water. The venue was a lot different than expected but the owners donated the space which you can’t beat. I'll have a full post on RMPFF soon. Just a quick report on the FFFT show at the Oriental in Denver - Great success. Sold out to over 325 viewers and everyone had a great time. Great Patagonia presence with the jacket give-away, banners and stickers. Lots of Down Sweaters in the house and no less than 7 Reel Pure hats - Moldy Chum is mighty strong in these here parts. Good Patagonia dealer representation also. Got the Boulder show tonight. I'll keep you updated. FFFT hits the Boulder Theater. Matty O'Connor helps drive sell-out attendance. The bar tab is still being tallied. Read all about it at RMPFF - http://rmpff.blogspot.com/2009/02/ffft-boulder-classic-combo. 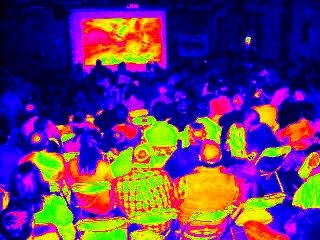 300+ rolled into the Emerson Theater seeking to be transported from their wintry Montana doldrums to a multitude of remote global fishing locations during a recent showing of the FFFT. A multi-generational crowd joined the action on screen with cheers, laughs and shouts as 2 hours of incredible imagery and adventure played out in front of them. The sipping fish, bent rods and cultural diversities all became one with audience. Echoed statements of "I'm ready to go fishing" or "I want to go there", were commonly heard during intermission and as they were walking out the door.